Oriental Lodge 9371 continued their tradition of supporting the local Chinese community with a Lodge donation to the Newcastle Chinese School in Heaton. Newcastle Chinese School is a charity funded organisation which first opened in 1974. The school is the largest and oldest Chinese school in the North East of England, offering both Mandarin (‘Pu Tong Hua’) classes and Cantonese classes of various levels from beginner to GSCE and A-Level standards. 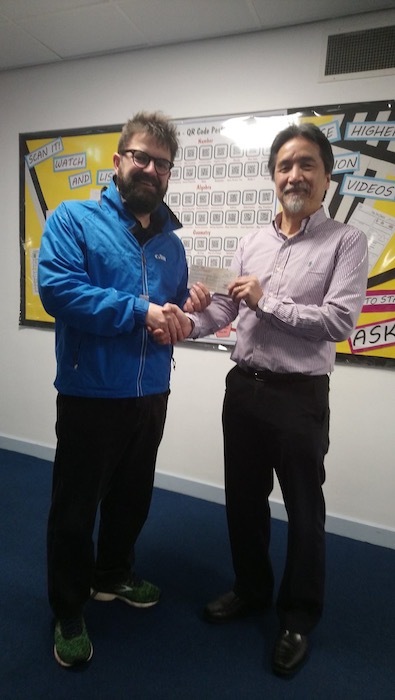 Mr Yip, the Headteacher of the Newcastle Chinese School, was delighted to receive the cheque which was presented by the Master of Oriental Lodge on behalf of the Lodge members. Mr Yip thanked Oriental Lodge adding “The annual donation we receive from the Freemasons really helps our school and will be put to good use”. Oriental Lodge has also made community donations this year to the South Mountain Chinese Association and the North East Chinese Association and following a long-standing tradition the Worshipful Master of the Lodge is entitled to nominate a charity each year to receive a donation. This year the Worshipful Master has nominated Greyhound Rescue North East to receive a donation from Oriental Lodge.